Using a stylish mix of marble, brass and oak we created a unique washroom space – the perfect fit for this recently refurbished high specification office in Mayfair. One Heddon Street is a beautiful Grade II Listed former cinema building located just around the corner from Piccadilly Circus in the heart of London’s prestigious Mayfair district. The five storey building has been sensitively refurbished and converted into a modern serviced office, providing co-working and flexible workspace, meeting rooms, an external terrace and a café area. Designed by award-winning architects, Barr Gazetas, the interior reflects the building’s heritage while meeting all the requirements of a 21st century office. We created and installed new washrooms for all five levels of the building as part of this project – all featuring a stunning combination of marble and brass, offering the perfect balance between contemporary and traditional styles. The brass effect accessories including wall-mounted taps, coat hooks, handles and cubicle locks, were paired with marble vanity splashbacks and oak veneer toilet cubicles to create a distinctive washroom design. 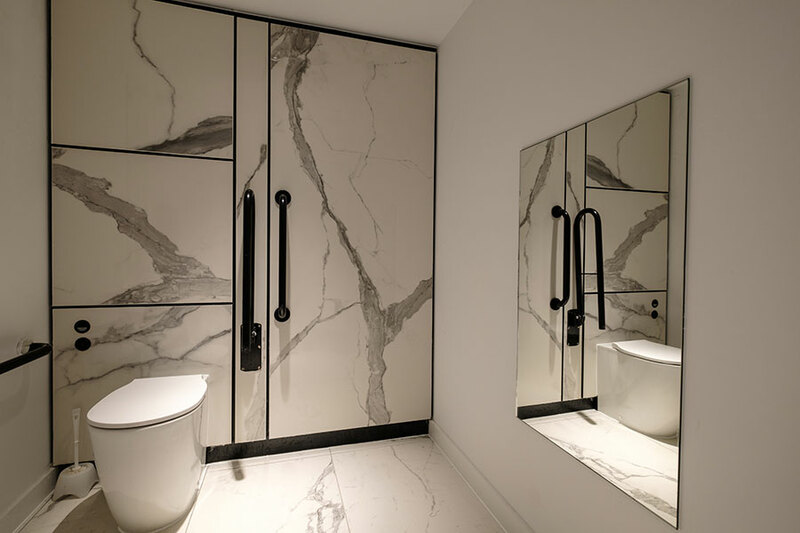 With washroom accessories now available in a wide range of different finishes, the trend to move away from standard stainless steel washroom accessories in certainly one to watch this year. 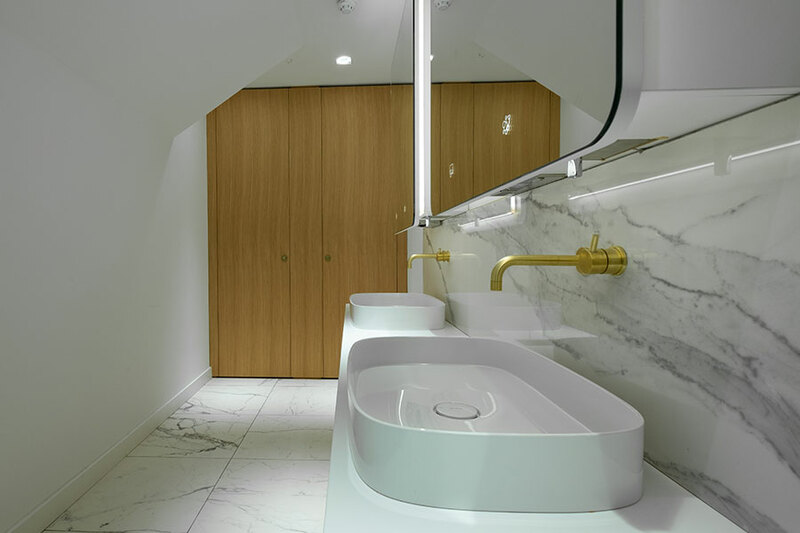 We manufactured the vanity units using solid surface Corian, which was specified in a bright white shade and also incorporates an inset waste bin. 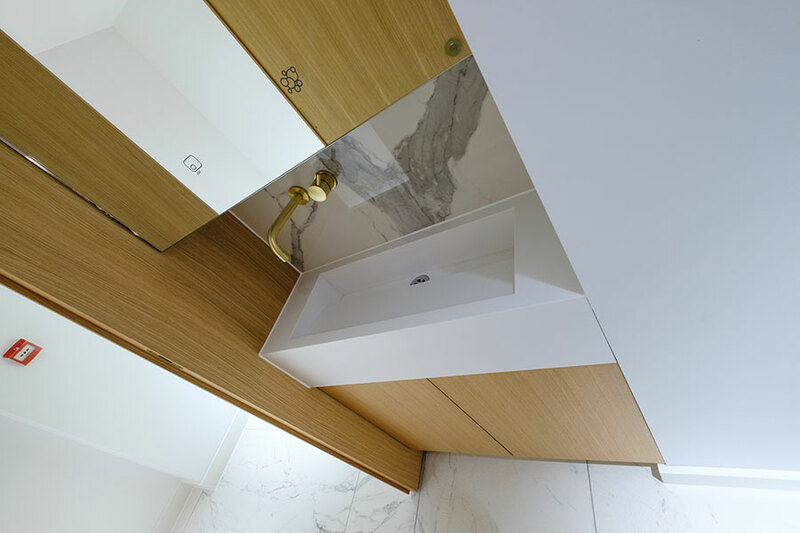 The white rounded edge counter-top sinks together with the traditional grey and white veined marble splashbacks, complete with complementing brass edging, soften the design and balance the crisp Corian unit. Our above sink Tego hinged mirror system, which includes concealed storage for soap and paper towel dispensers, clearly marked with symbols etched on to the mirror glass, also feature curved edges to reflect the sink shape and are backlit to provide soft lighting. Our full height, floor to ceiling, Alto toilet cubicles, were manufactured with a stunning matt finish real wood oak veneer. The rebated flush system façade offers a stylish virtually seamless façade to create the ultimate design statement. The same wood in the same finish also used for the vanity under panels. 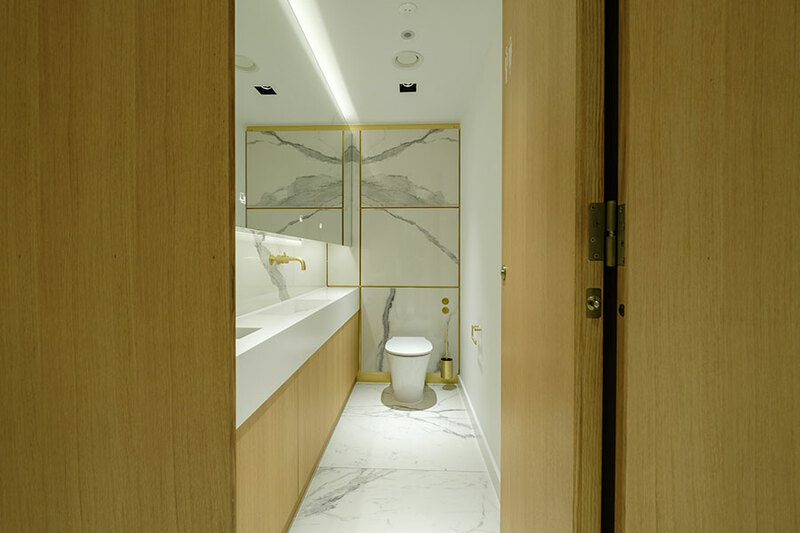 We also installed marble faced Concerto duct tiled panelling complete with brass trim, behind the WCs to match the vanity splashbacks and marble tiled floor. The duct panelling not only conceals unsightly pipework for a smooth finish, but is also designed to allow ease of access for any future repairs or maintenance required.